(Friday, April 12th) Ohio’s 6th District Congressman took a moment during a hearing to ask the CEO of Facebook how user accountability works. Mark Zuckerberg appeared at an Energy and Commerce Committee hearing Thursday to address data misuse. Congressman Bill Johnson recounted an earlier hearing point related to faith-based material from Franciscan University, in his district that had been taken down. Zuckerberg admitted that it was a mistake. Johnson asked how content on Facebook is filtered and determined to be appropriate, whether through an algorithm or a team. Additionally, he questioned if someone is held accountable if they take something down that shouldn’t have been or leaving content up that is a “red flag”. Zuckerberg said that for content reviewers, their performance is measured if they do their job accurately. 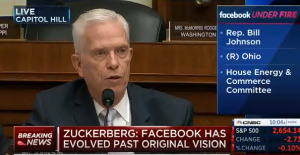 Johnson noted that while Zuckerberg is essentially an American success story, there has been an acknowledgement of a break down in responsibility.